The song has been added to HNDRXX on streaming services. Future has shared new music and a video for new Chris Brown collaboration "PIE." The visuals were revealed shortly after last night's BET Awards, where Future performed "Mask Off" with special guest Kendrick Lamar. In a Life Of Pablo-esque move, the song has been added to HNDRXX on streaming services. 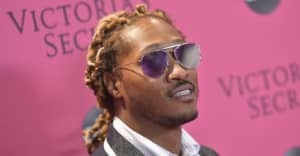 Future recently announced an extensive world tour, in support of HNDRXX and his other 2017 album FUTURE. Check out the "PIE" video above.